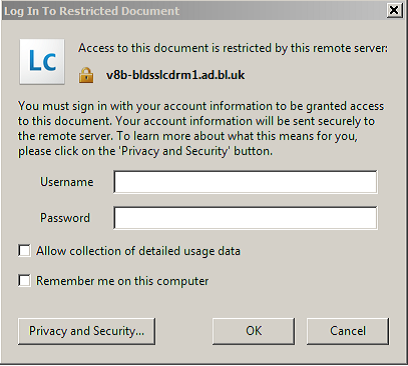 This page tells you how to open a document from BLOD and gives advice on what to to if you encounter problems in accessing or viewing your documents. The email sent to you by QMU Library will contain the link to your document, clicking on this link will take you to the download page. If you are registered fro BLOD and the system recognises your email you will be prompted to download your document. If you are registered for BLOD but the system does not recognise your email address then you will be prompted to enter your username and registered email address before you click to download your document. If you are not registered for BLOD please go here for instructions on how to register for an account. Once you click to download your document you will be presented with the following screen. Enter your username and password to open the document. You will need to enter these details each time you wish to access the document unless you tick the "Remember me on this computer" box. Please DO NOT tick this box if you are accessing your document from an on-campus terminal, using the Remote Desktop, or on a shared computer off campus. Why won't my document download or open? Are you using Adobe Reader as your PDF reader? Are you using a compatible version of Adobe Reader? Has a previous user locked you out by selecting "Remember me on this computer"? Has the download link expired? Does your username contain the "@" symbol? Online access is needed every time you open the document. This is a feature of the digital rights management software to ensure that the document is only accessible to the authorised user. In Adobe Reader go to Edit/Preferences/Security and click and confirm the "Clear remembered account information" option. then retry the downloaded link. The download link will remain active for 30 days from the date of dispatch. If the download link has expired the item will need to be re-ordered which will incur a fresh ILL charge.